Bitcoin has grown massively over the last year, both in terms of price and exposure, and even people who hadn’t heard of it in the past 8 years are now trying to get in on the action. Since it rose from a mere $1,000 in January 2017 to $20,000 in December, its new-found fan following shouldn’t come as a surprise. But such gains, are unprecedented in traditional markets, and Bitcoin’s sudden rise has attracted a lot of criticism from financial gurus like veteran investor, Warren Buffet and JP Morgan CEO, Jamie Dimon. The question everyone seems to be asking is whether Bitcoin and the crypto market as a whole is a huge bubble, and if so, will it have the same fate as the dot-com boom in the late 90s and early 2000s. Back in the late 90s, we saw the emergence of a new trend – online assets and internet companies, such as Amazon and Yahoo were created, among with a host of others which you don’t know now, because they went bust. As the dot com craze took off, people invested millions of dollars in new startups without any proven records, and when the time came for results, most of those startus went under, along with all the investments, as share prices tanked. The dot-com bubble is a valuable lesson from history, particularly on what happens when speculation goes rife and people bet on projects merely on promises of “what will be” than “what is”. Does that not sound eerily similar to the cryptocurrencies space today? Today also, people are betting big money on emerging cryptocurrencies, some even with mere whitepapers (those too plagiarized) and then we have ICOs, raising millions of dollars in funding for ideas that would struggle to attract even $500,000 from traditional VC investments. What does this mean? Is there a crypto bubble? Definitely. There is no doubt about a crypto bubble having formed and currently growing bigger. At the beginning of 2017, the total marketcap for cryptocurrencies was no where near the current $0.7 trillion figure it has reached. In comparison, how many successful implementations of blockchain technology do we see today? The Ethereum network barely managed to keep the CryptoKitties application afloat and Bitcoin itself is clogged with the volume of existing transactions. However, one thing is fundamentally different, and that is the spirit of cryptocurrencies and the low barrier to access for small investors. With the dot com bubble, investments were mainly from large investors, but with cryptocurrencies, we are witnessing regular people buying in with as little as $10 or $50. Additionally, the concept of cryptocurrencies – money that is not controlled by governments, has managed to find footing in the hearts and minds of people, particularly given how the existing financial system is failing so many countries. The hyper inflation in Zimbabwe and Venezuela are just two examples of how government backed currency can result in financial ruin, if improperly managed. In comparison, cryptocurrencies follow the “code is law” rule, and are immutable, cannot be generated on demand and have mathematical computations backing them up. 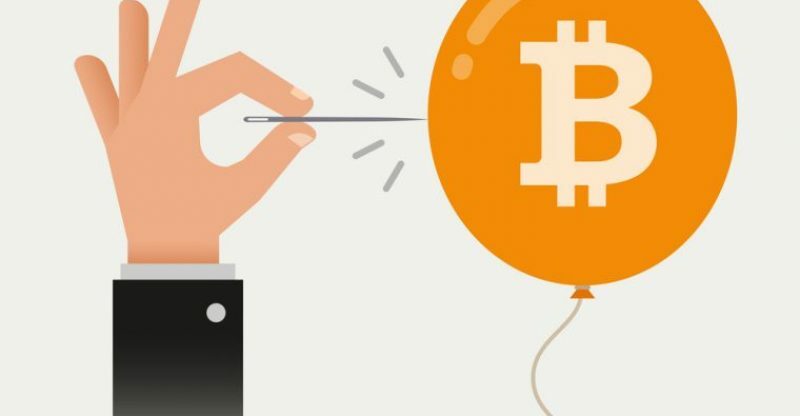 How to survive the crypto bubble? The dot-com crash left many investors with nothing, save those who had diversified their investments. The same is the case with the crypto space. There is money to be made, but smart investors are taking profits and re-investing them in other assets, such as real estate and gold, effectively hedging their risks. Just because cryptos are volatile and risky, does not mean you should stay on the fence. The current market is possibly one of the biggest opportunities of our lives to make money – all you need to do is play it smart, manage risk and invest only as much as you’re willing to lose.